It’s always a disappointing moment when the winning lottery numbers are announced and not a single one of your chosen numbers were called, but thanks to the introduction of some lottery loyalty programs, the possibility of winning doesn’t have to stop there. This article takes you through some of the loyalty programs available for Australian lottery players both online and offline. Some land based Aussie lottery outlets have started offering loyalty and membership programs to regular lottery players in order to make playing lottery easier and safer, while also adding some additional rewards. With Australian lottery games now being accessible online, you don’t need to make in-store purchases to be eligible for these loyalty programs. Typically, these lottery loyalty programs offer players the benefit of never having to worry about misplacing a winning lotto ticket again, with all unclaimed prizes automatically credited to your registered membership card or online account, or sent via cheque upon request. If you have a lottery loyalty card and you lose your winning ticket, a stop can be put on the ticket to avoid your prize being claimed by anyone else. Loyalty program cards can be linked with online lotto accounts so you can view your ticket history, keep track of any unclaimed prizes, check your tickets, save your favourite numbers, and pay membership fees and update your contact details over the Net. The NSW Players Club card can be used anytime you buy tickets to the Saturday Lotto, Monday & Wednesday Lotto, Oz Lotto, Powerball, Lotto Strike and The Pools. The major benefit of this lottery loyalty program is the exclusive $1,000 monthly bonus draw. Every month you use your Players Club card when purchasing a lottery ticket, you’ll receive one entry to the prize draw for every dollar you spend. Then each month, each of the lottery games has its own draw where seven lucky players are selected at random to win a $1,000 cash prize. The Tatts Card is available to residents of Victoria, Tasmania and the Northern Territory and can be used anytime tickets are purchased to TattsLotto, Powerball, Oz Lotto, Monday & Wednesday Lotto and The Pools. 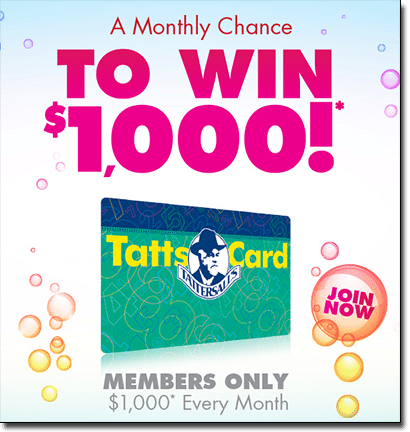 It is basically identical to the NSW Players Club, with the major benefit being the $1,000 monthly prize draw eligible for all Tatts Card users who made a lottery purchase that month, with every $1 spent equating to one entry ticket to the prize draw. Residents of South Australia can get access to the SA Lotteries Easiplay Bonus Draw, where every time you register an SA Lotteries ticket to your Easiplay card you’ll go into the monthly draw to win one of four $5,000 cash prizes. You’ll receive one ticket to the Bonus Draw for every $1 spent on eligible SA Lotteries tickets, with draws held every month on the second Monday following the lottery draw. Available to residents of Queensland, the benefit of being a Golden Casket loyalty member is you get access to the $5,000 weekly bonus draw. Every time you purchase and register a QLD lottery ticket to your Winners Circle Players Club Card, you’ll receive one entry into the next draw for every dollar you spend. Bonus draws happen every week of the year, with five lucky players walking way with an extra $5K each week. Results of the $5000 bonus draw are announced every Saturday night on Channel 7 or can be viewed online. Jumbo Lottery – Jumbo Lottery is an online lotto incentive giving Aussie players access to OzLotteries.com, a one-stop-shop where you can purchase tickets to every Australian lottery draw from the one secure site. It’s free to join and you’ll get daily results emailed to your inbox and access to mobile lottery purchases. Membership does not currently give you access to a loyalty reward program, but the company has stated a loyalty program is currently in the works. Lottery Rewards – LotteryRewards.com is an online program which turns every lottery ticket into a second chance to win. All you need to do is sign up for a free account and enter your lotto ticket details and you could win cash during daily draws. Members also accumulate reward points for every ticket entered, with points which can then be used to enter more draws or in the PlayCentre. So far Lottery Rewards is only available for USA state lotteries, but as popularity of this service grows we hope it may soon extend to Australia. Although nowhere near as big as the jackpots found in state and national lotteries, some online casinos offer live dealer lottery games which can be played for real money. These casinos extend loyalty programs to their players, where points are accumulated every time real wagers are placed in exchange for rewards like bonus credits, free spins and even real world prizes further down the track. Online casino loyalty programs typically work in membership tiers, where player start at the bottom (usually called bronze status) and progress up through different tiers, all the way to diamond or platinum status. While not all Internet casinos offer online lottery games, you can also accumulate casino loyalty points playing pokies, blackjack, roulette, scratch cards, video poker and other table games.